Young people heading for university need much better preparation for what they can expect, say researchers. After all the effort of getting a university place, the Higher Education Policy Institute study suggests, there can be unrealistic expectations. Most young people expect to have more teaching hours in university than in school, when the opposite is the case. The study also found that young people with a mental health problem were unlikely to have told their university. There have been many surveys of student attitudes - but this is unusual in looking at the expectations of young people about to become students. The study, carried out by the Higher Education Policy Institute (Hepi) and Unite Students, suggests that as well as being excited and nervous, many students are deeply ill-informed about what to expect. 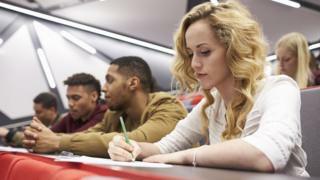 About half a million new students begin university courses in the UK each year - and an annual Hepi study published earlier this year suggested that only about a third thought they were getting good value for money. The latest study, based on a sample of more than 2,000 young people, suggests this could be because expectations of university life are unlikely to be matched by the reality. In terms of "contact hours", 66% of the young people surveyed thought university would mean more group work than in school and 60% thought there would be more lecture hours than classroom hours in school. But in practice, teaching hours at A-level or equivalent will probably be much higher than at university - with students on degree courses such as history often having fewer than 10 hours per week. There has been much concern about mental health problems among students - but this study suggests that universities might not be informed about pre-existing conditions or concerns. Only about a third of the would-be students with a mental health condition intended to disclose it to the university they were planning to attend. There has also been debate about whether students' parents should be informed of their adult children's mental health problems at university. This study found that only about one in five of the would-be students thought that parents should not be told. For many young people, this will be the first time that they will have lived away from home and shared with other people. The survey found that those from poorer backgrounds were less prepared for meeting strangers and building a new social circle - and that these poorer would-be students were more likely to be planning to live at home. There are also suggestions that young people are not clear about the costs ahead of them. Aside from tuition fees, accommodation is likely to be the biggest cost for students living away from home. But when asked about their finances, only about half of the would-be students identified rent as the biggest expense. Others thought that their biggest spending would be on "course materials", "nights out", "groceries" or "student societies". Nick Hillman, Hepi's director, said that this suggested more should be done to help in the transition between school and university. "We know lots about what students think but very little about what those applying to higher education expect to happen when they get there," said Mr Hillman. "We set out to fix this gap because people who expect a different student experience to the one they get are less satisfied, learn less and say they are getting less good value for money. "Most applicants expect to spend more time in lectures than they do in school lessons, but few university students actually do this. "Almost three-quarters of them expect their future university to contact their families if they face mental health issues, but this is a legal minefield so typically does not happen. "Schools, parents and universities - not to mention policymakers - all need to help school-leavers get real about their expectations." Universities Minister Jo Johnson said: "People will have different expectations of a university education, but what is indisputable is the expectation for excellent teaching and a good return on their investment."